Wooden folding chairs are our most popular chair and kept in stock. We can source other chairs on request. Table linen can be supplied in various colours to complement your event. Embellish your special event with the addition of our selection of lights. Spot lights can be used to light up the top of the marquee and coloured gels enhance the overall lighting effect. The uplighter enclosure is made from polished stainless steel and coloured gels can be used to create the right mood for your function. 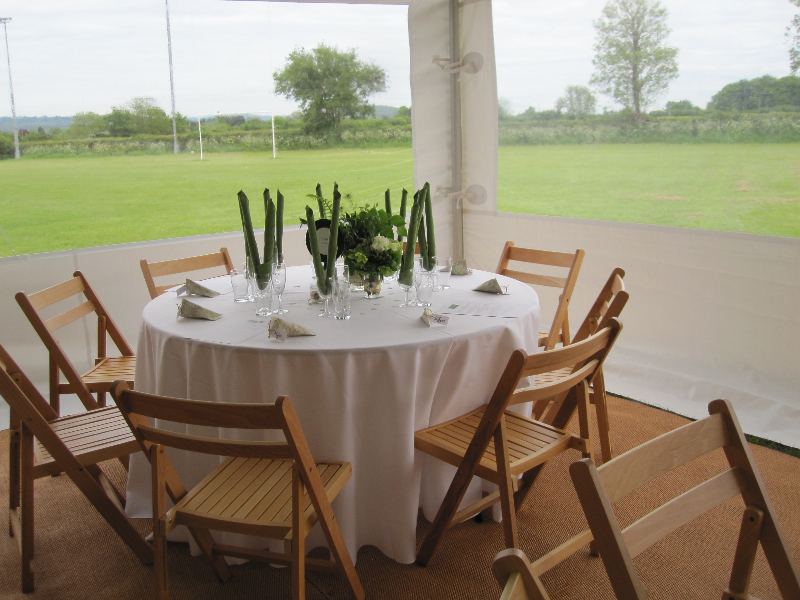 Uplighters can be linked together to light up your whole marquee and match the colour scheme you choose. Delicate pea lights give that magical feel and are often used in conjunction with uplighters to make you night sparkle. Pea lights link together making a continuous daisy chain around the marquee or by the use of 6 way adapters can create a canopy effect which is stunning at weddings and special events. Our pea lights are suitable for outdoor use. Light up you paths and walkways with our festoon lights with a choice of several different coloured bulbs.